PASCAGOULA, Miss. (Sept. 12, 2017)—Huntington Ingalls Industries’ (NYSE:HII) Ingalls Shipbuilding division launched the Arleigh Burke-class (DDG 51) guided missile destroyer Delbert D. Black (DDG 119) on Friday. 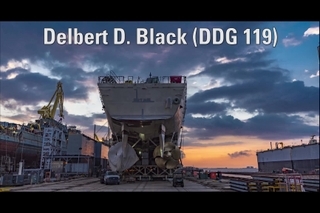 Delbert D. Black was translated via Ingalls’ rail car system to a floating dry dock. Once on, the dry dock was moved away from the pier, and it was ballasted down to float the ship. 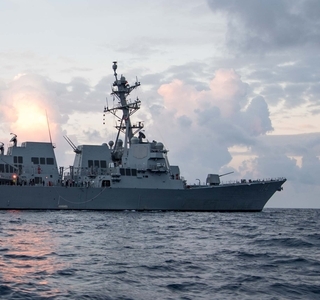 To date, Ingalls has delivered 29 Arleigh Burke-class destroyers to the U.S. Navy, most recently delivering USS John Finn (DDG 113), which was commissioned on July 15. 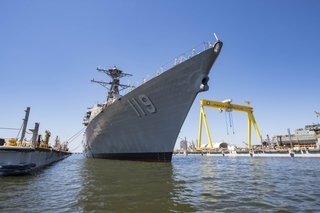 Other destroyers currently under construction at Ingalls include Paul Ignatius (DDG 117), Frank E. Petersen Jr. (DDG 121) and Lenah H. Sutcliffe Higbee (DDG 123). 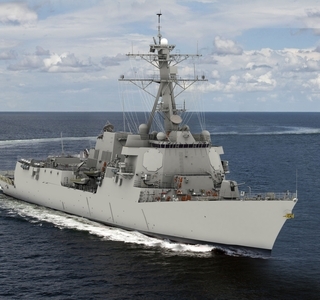 In June, Ingalls received a contract modification to incorporate the “Flight III” upgrades to Jack H. Lucas (DDG 125), which will start fabrication in 2018. 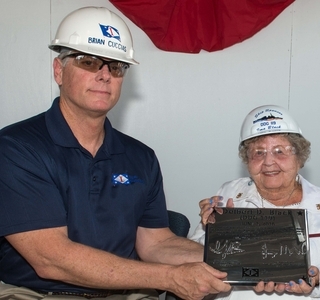 The ship is named in honor of Delbert D. Black, who served as a gunner’s mate in the Navy and was aboard the battleship USS Maryland (BB 46) during the attack on Pearl Harbor. Black served in three wars and was the first Master Chief Petty Officer of the Navy.